As a person who lives on a farm a Powerwall battery I am a likely customer if the battery when teamed up with a solar array is a cost effective replacement for utility company generated electricity. With my current electrical cost of 12¢ per kilowatt hour a 7kWh battery will save me $0.84 a day. If we ignore the investment cost of producing the charging electricity with a solar array, it will take about 9.78 years to break even under perfect weather conditions. If we assume that I would probably be willing to take a chance on the battery if the payback was 5 years or less then, that either the electrical rate has to go up to 24¢ per kilowatt hour or the battery cost has to drop to $1,500 for the battery. 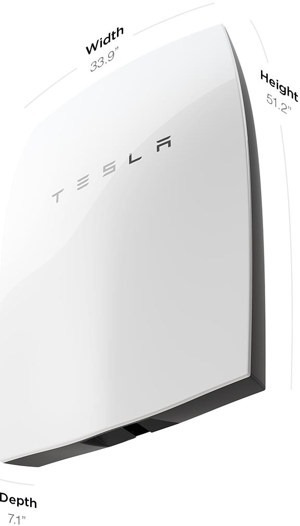 Here are the specifications on the Powerwall. Technology – Wall mounted, rechargeable lithium ion battery with liquid thermal control. Warranty Ten year warranty with an optional ten year extension. Installation Requires installation by a trained electrician. AC-DC inverter not included. ← Things that make me go hmm… How Can Planned Parenthood Sell Body Parts From A Nonviable Fetus?